"In early 1846 United States troops under the command of Gen. Zachary Taylor marched into the disputed territory between the Nueces River and the Rio Grande and constructed a defensive position across from Matamoros. 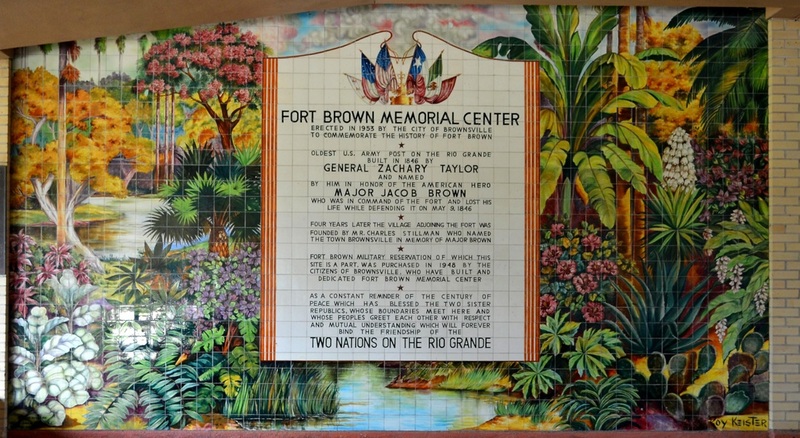 The temporary fort was originally called Fort Texas but was renamed Fort Brown a short time later, in honor of Maj. Jacob Brown, who died during a Mexican attack on the stronghold. on July 4 the area officially became part of the United States. 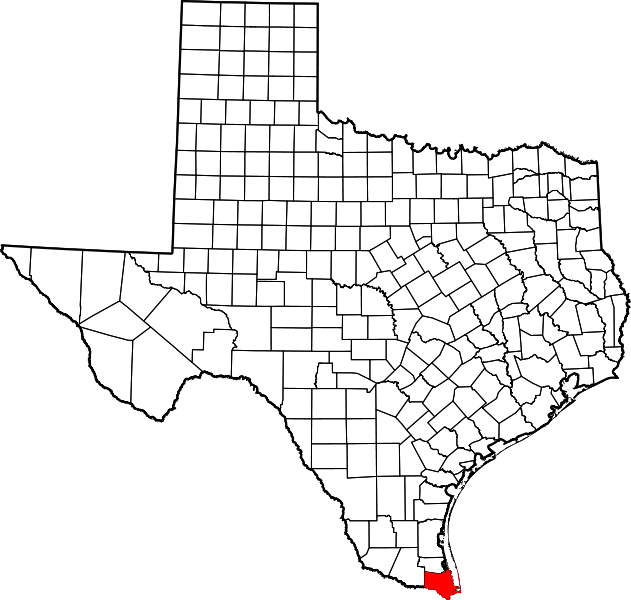 The new county encompassed 3,308 square miles, including parts of the future Hidalgo, Willacy, Kenedy, and Brooks counties. 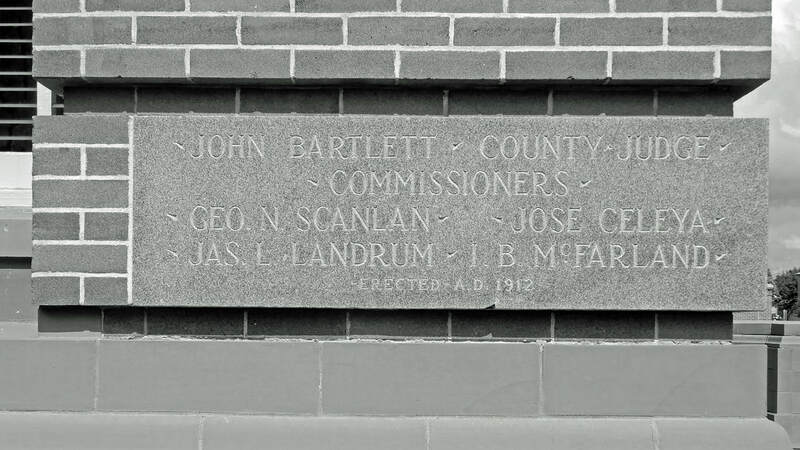 An election of county officers was held on August 7, but organization was not completed until September 11. Santa Rita, five miles downstream from Fort Brown and believed to be the earliest English-speaking town in the area, was made the county seat. 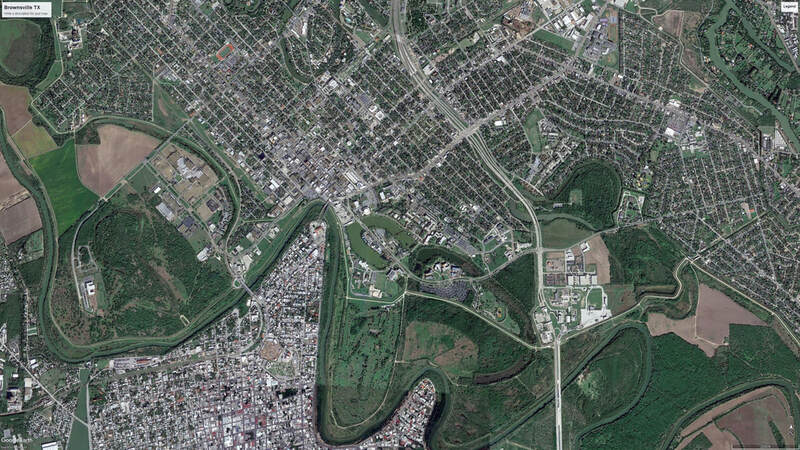 The same year Charles Stillman established Brownsville just west of Fort Brown. 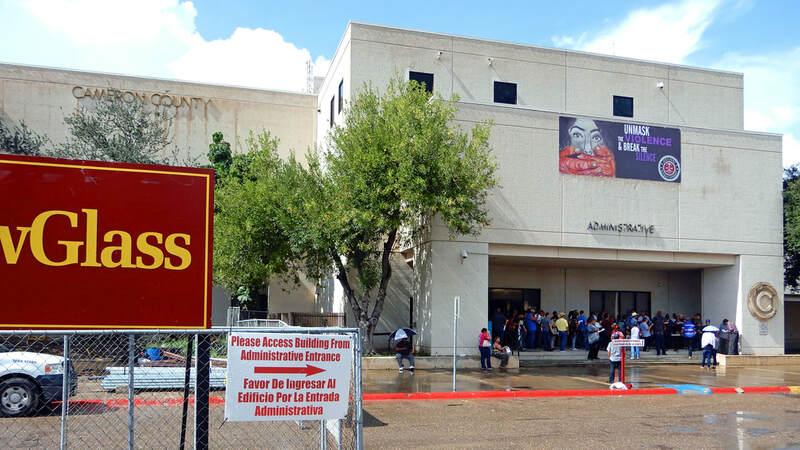 In December another election was held, and after intense effort on Stillman's part Brownsville was chosen county seat." 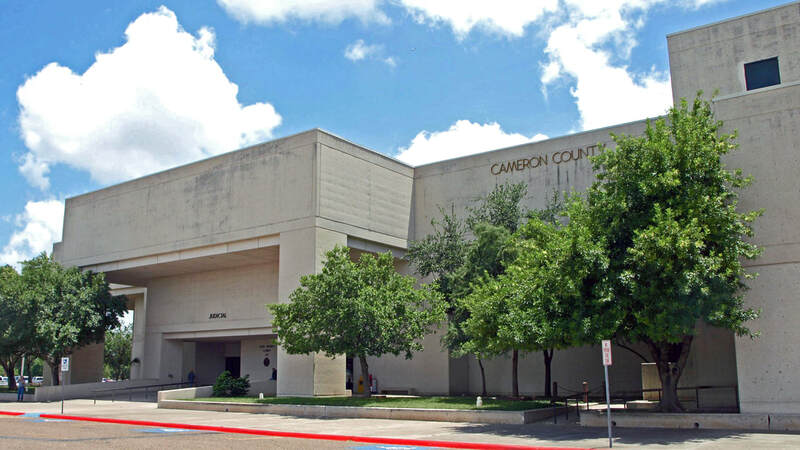 I visited Cameron County and photographed the courthouses in Brownsville on June 14, 2010, September 26, 2014, and October 3, 2017. 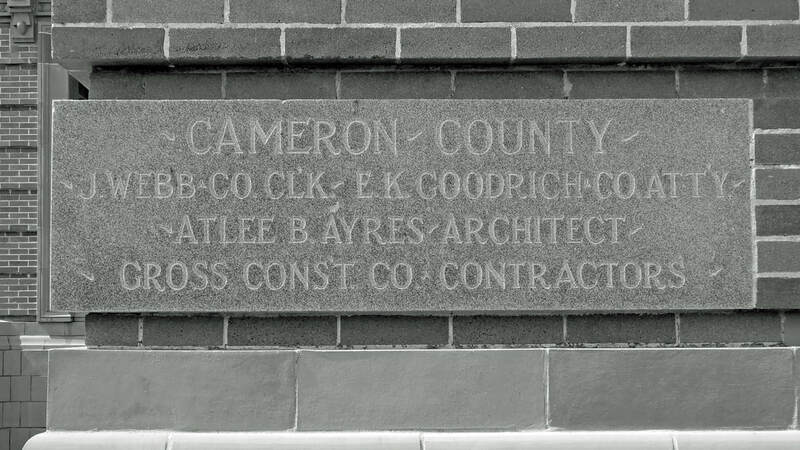 Cameron County is the southernmost county in Texas. In the continental United States, only Monroe County Florida is further south. The Rio Grande river enters the Gulf of Mexico in Cameron County. 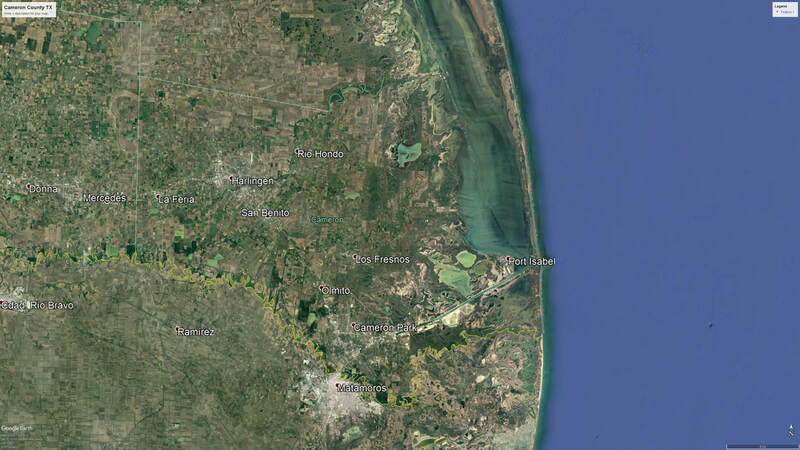 The Lower Laguna Madre viewed from South Padre Island, Cameron County. 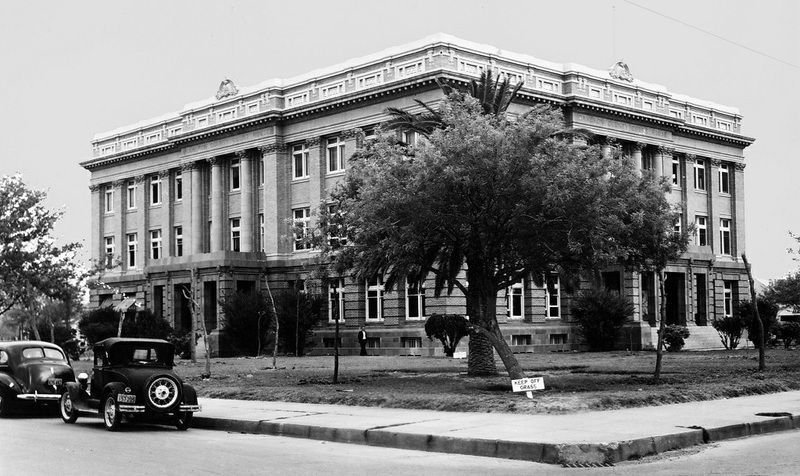 Cameron County courthouse, circa 1939, courtesy TXDOT. 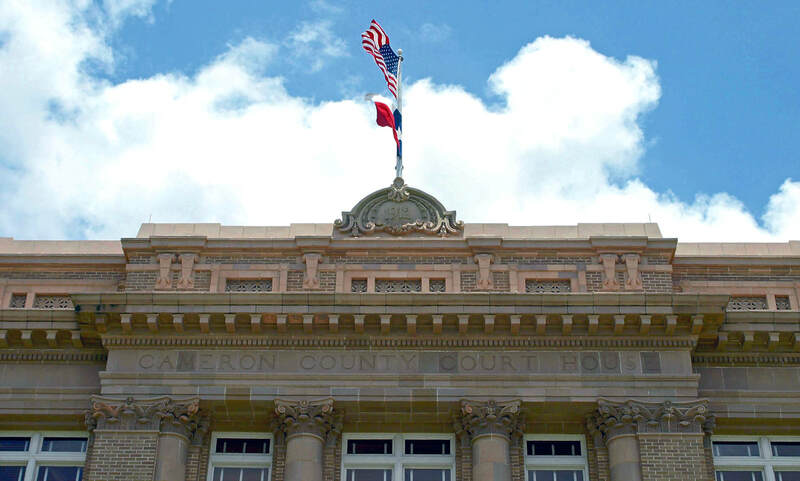 In the first decade of the 20th century the Cameron County population increased by 69 percent. 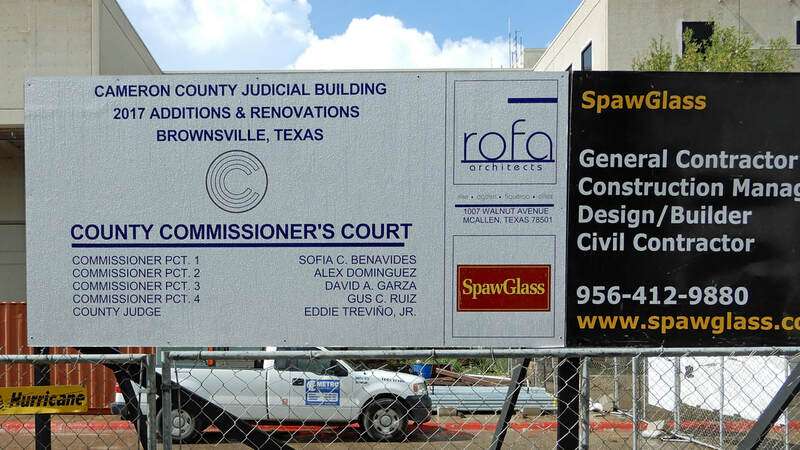 In response to this significant growth, San Antonio architect Atlee B. Ayres was retained by the county to design a larger courthouse, located on a new square in a residential area, at some distance from the commercial center of Brownsville. 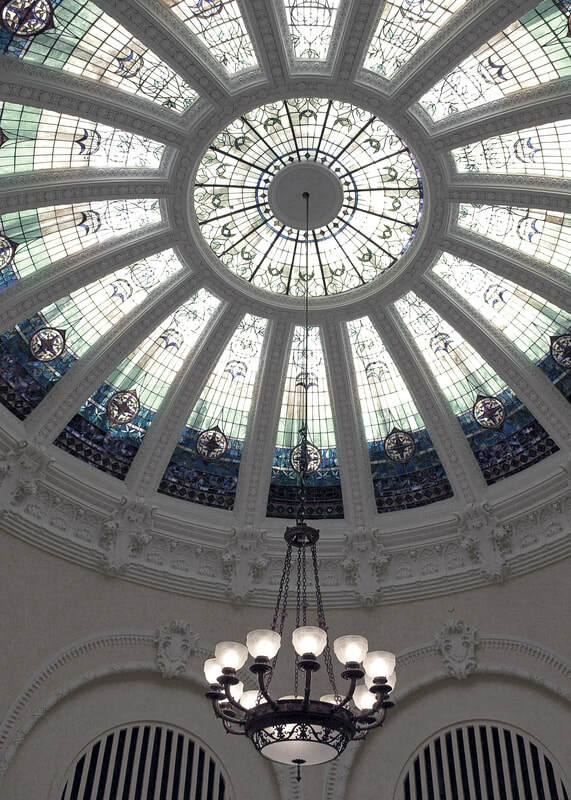 The style is Classical Revival, with an odd helping of Louis Sullivan and Frank Lloyd Wright inspired details, the work of Ayres' draftsman, George Willis, a former employee of Wright. An eclectic mixture, to be sure, the exterior of the courthouse has one foot in the past and the other in the future. 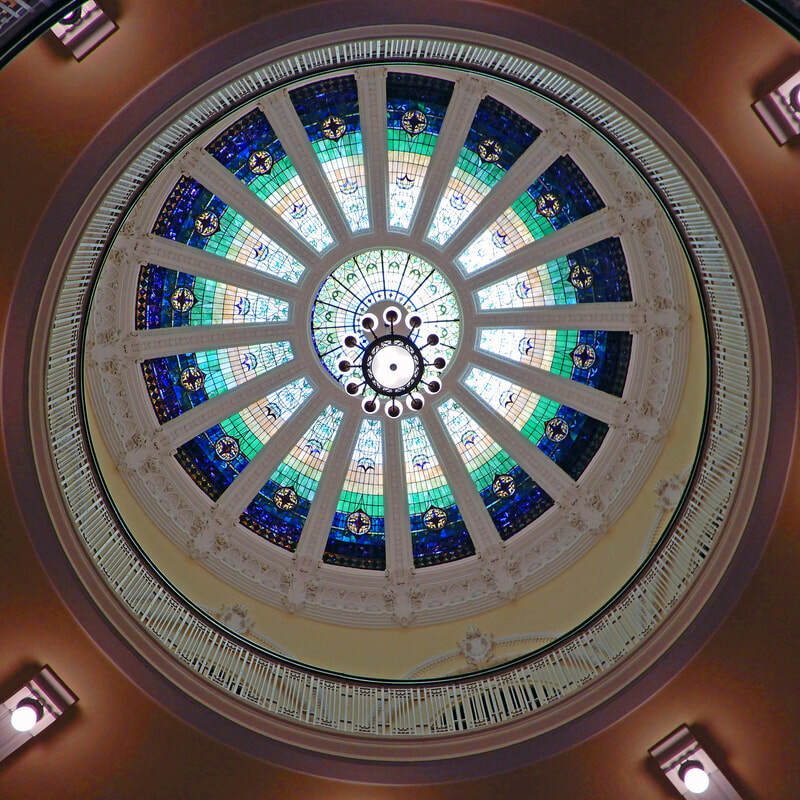 The building's best feature, a beautiful rotunda topped by a domed skylight, is truly a hidden jewel. 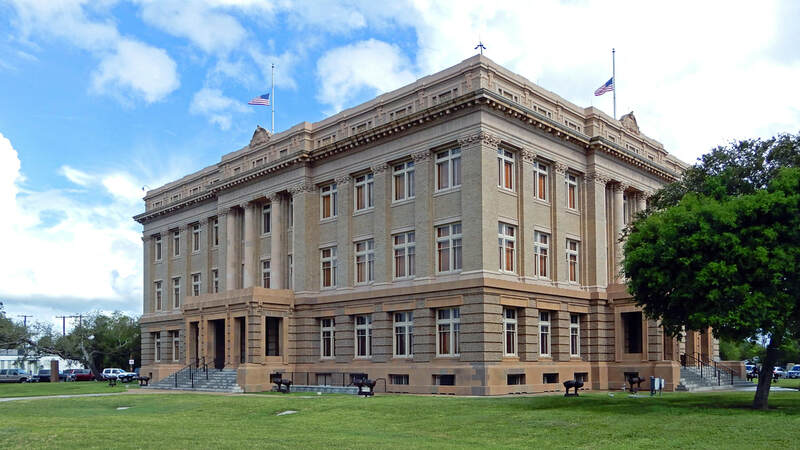 Named the Dancy Building in honor of County Judge Oscar Cromwell Dancy, who championed its construction in 1912, the historic courthouse now houses the Cameron County Court at Law No. 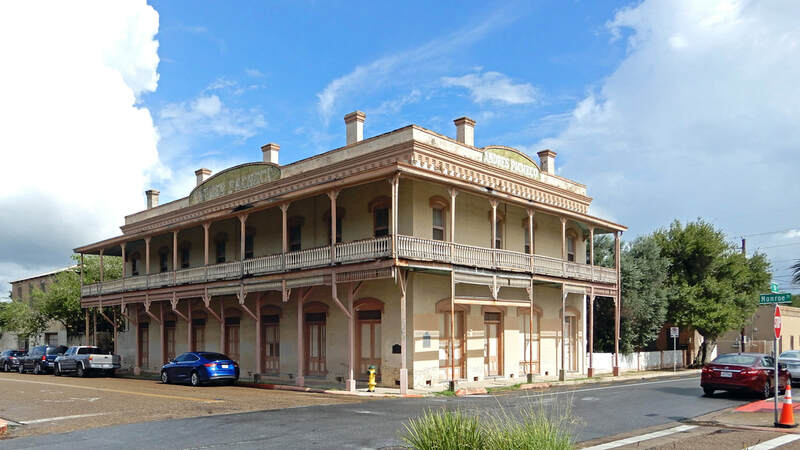 1 as well as county offices.. 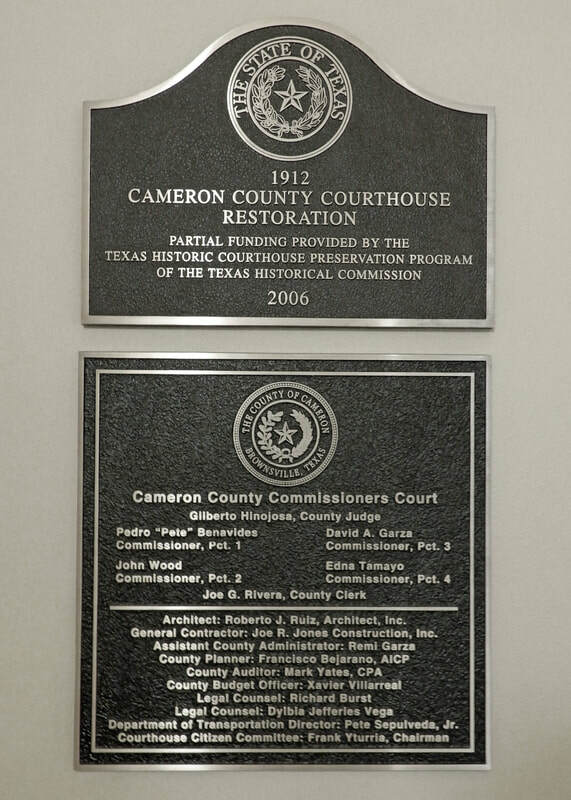 The Cameron County courthouse was re-dedicated in October 2006 after a complete restoration partially funded through a Texas Historic Courthouse Preservation Program Grant. 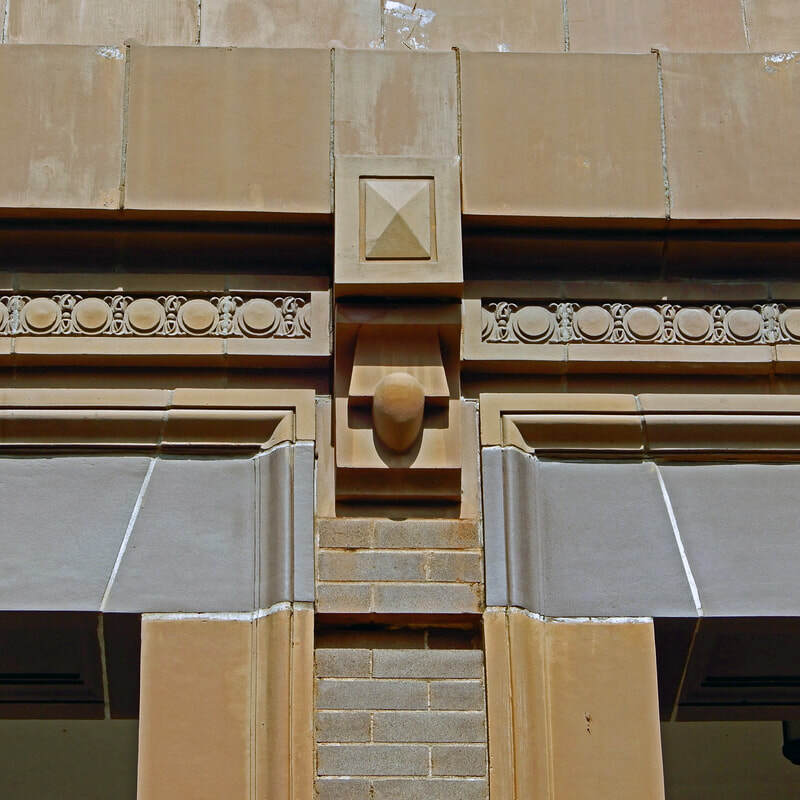 However, over time, problems developed with the original terra cotta facade. 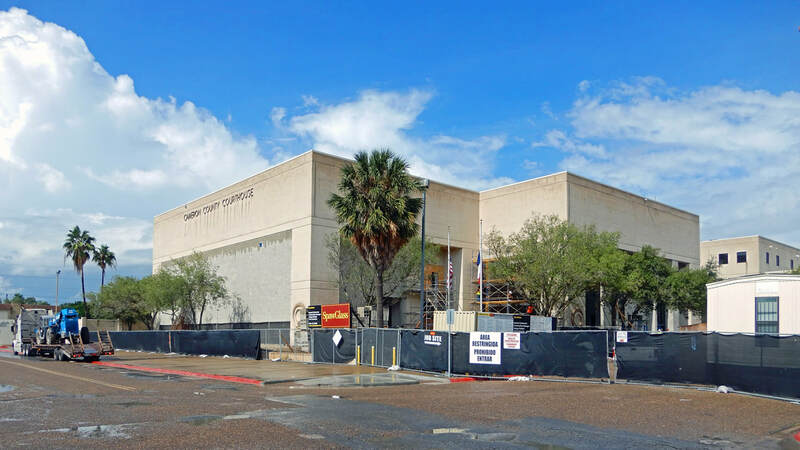 In 2013 A report by the San Antonio-based architectural firm Ford, Powell and Carson noted that repairs were necessary to the Dancy Building’s roof, windows and terra cotta as part of an effort to keep the historical building from deteriorating. 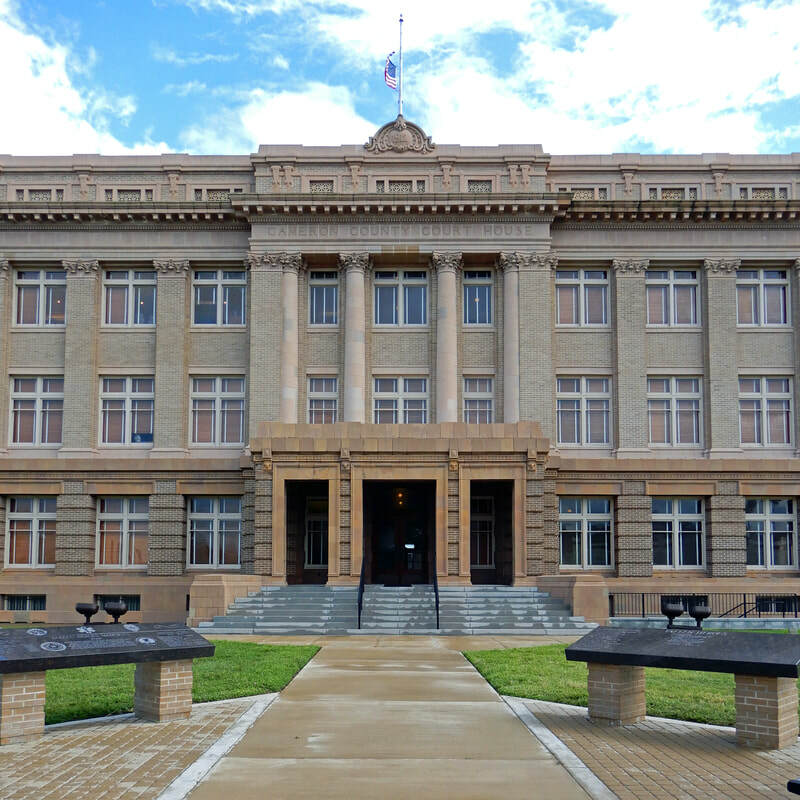 The Texas Historic Courthouse Preservation Program Round IX Grant Recipients (July 22, 2016): Cameron County—$450,000 emergency grant award to address terra cotta repairs on the facade of the 1912 courthouse. 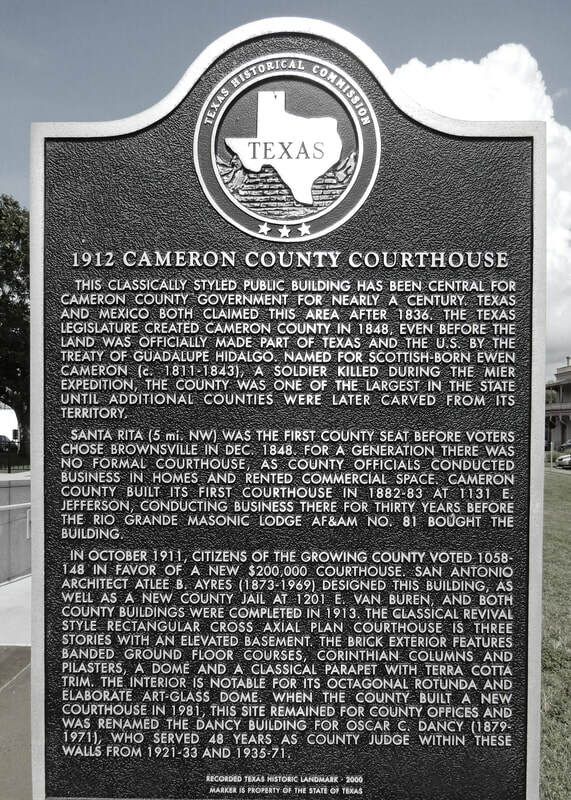 Cameron County restored the exterior of the 1912 courthouse in 1995-98. However, the terra cotta repairs including the stainless steel fasteners were only made in limited locations. 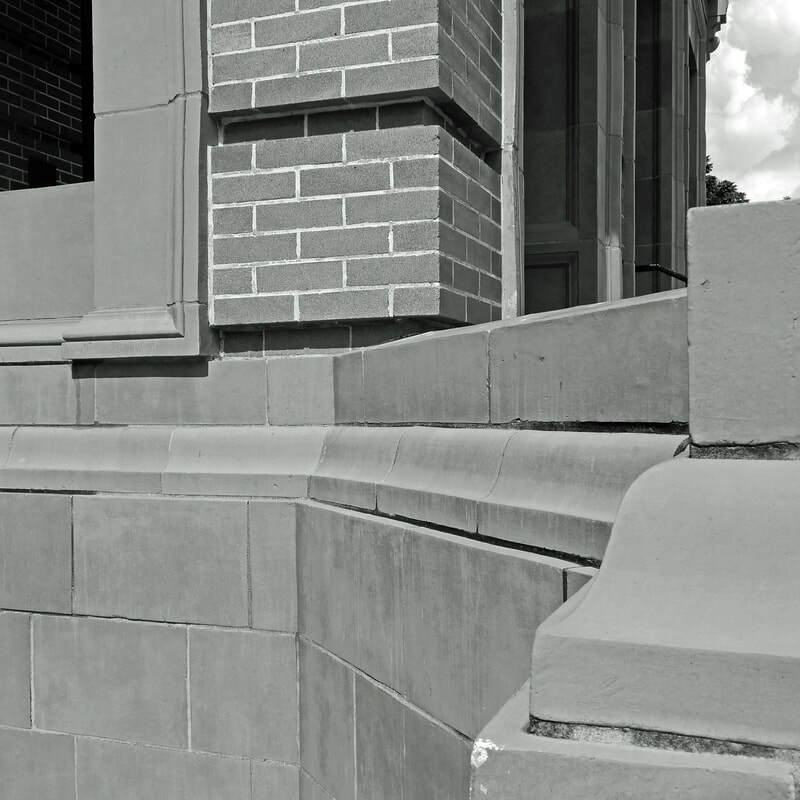 The terra cotta has since further deteriorated, particularly the cornice, which is cracked and failing due to the corrosion of the masonry reinforcements. 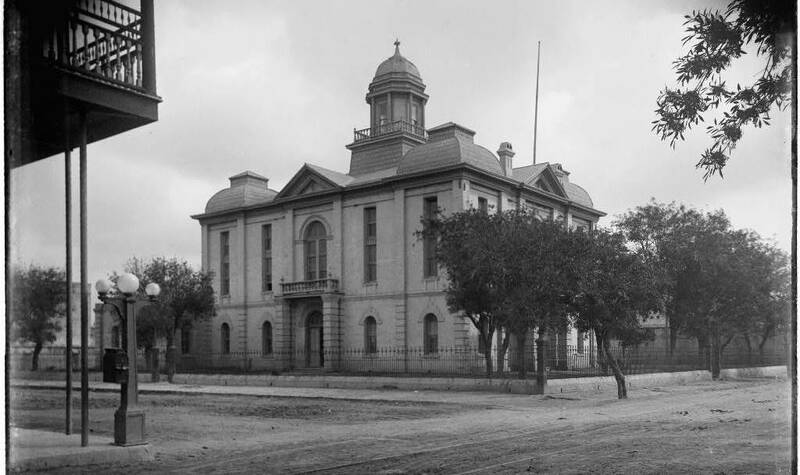 The historic 1912 courthouse is visible on the lower left, in the center of a city block. 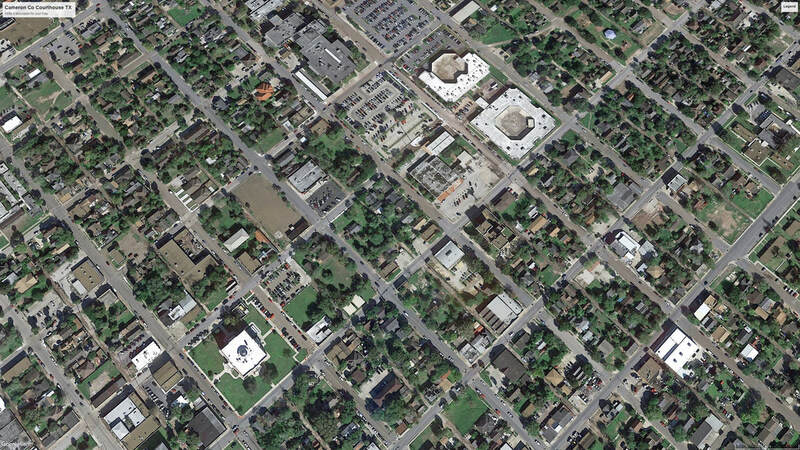 The current courthouse and county jail buildings are a few blocks north, in the top center of this aerial view. 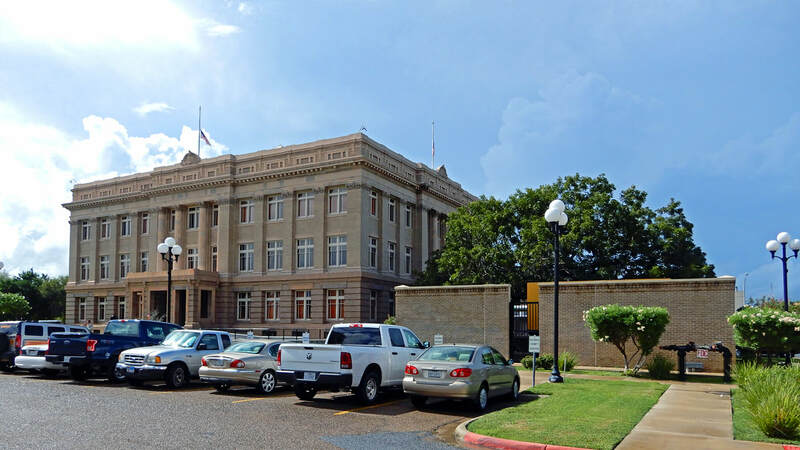 The courthouse square, like the city grid of Brownsville, is oriented 45 degrees from true north-south. This view is of the south corner. The porch on the left faces southwest, on E. Madison Street. This is considered the "front" of the building. In plan the building is nearly square, with one additional bay on the longer sides. 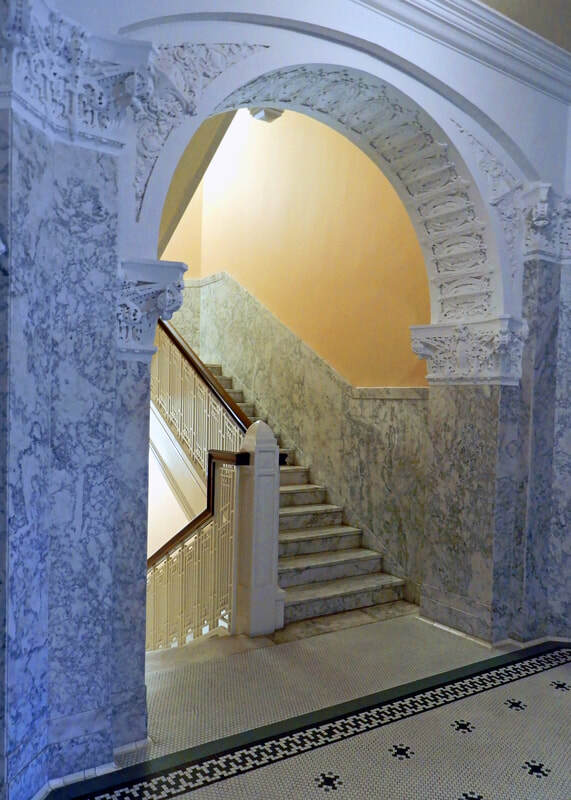 The "style" of the exterior evolves from the Chicago School (Sullivan & Wright) on the first floor to a traditional classical style on the second and third floors. 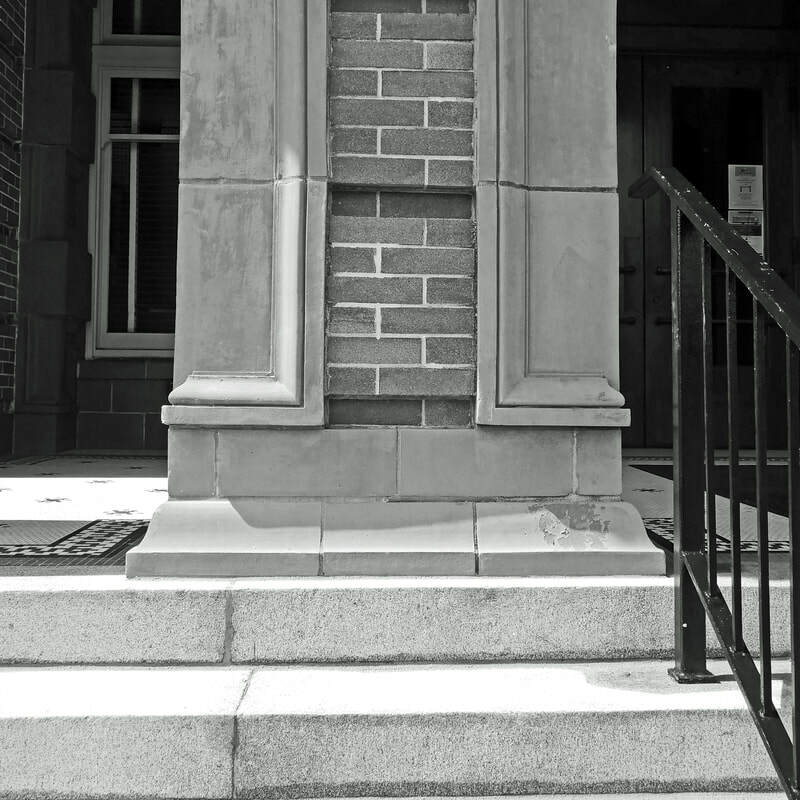 A close-up view of the first floor porch detailing. This is the work of George Willis. 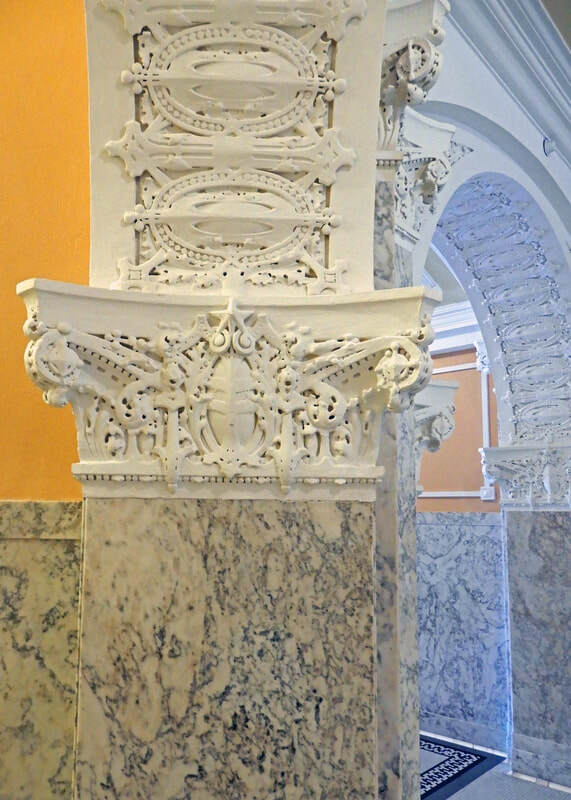 The columns and entablature are done in the classical revival style. 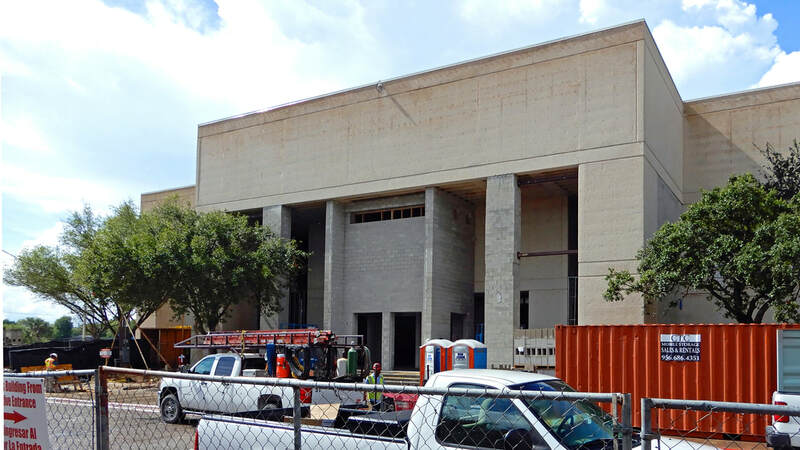 The primary axis of the building is southwest to northeast. This is the northeast facade, on E. Monroe Street. 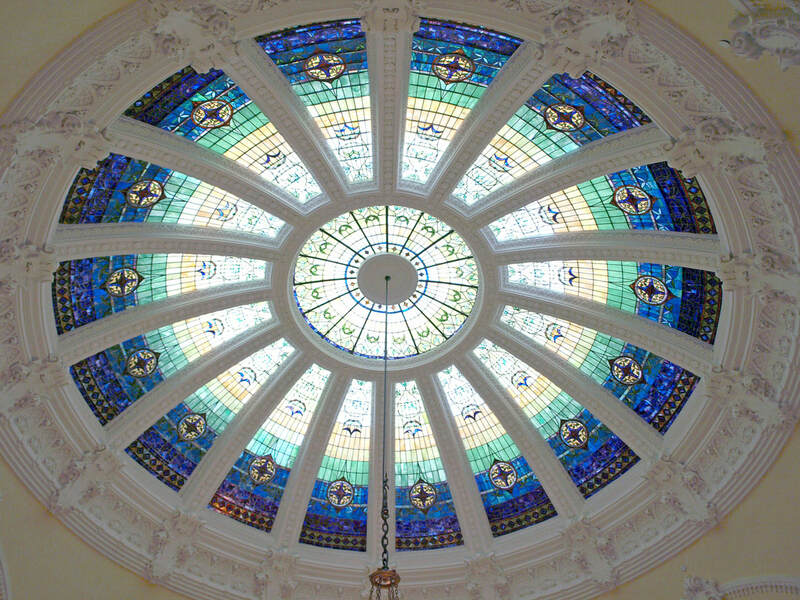 The rotunda is topped with a lovely stained glass dome. 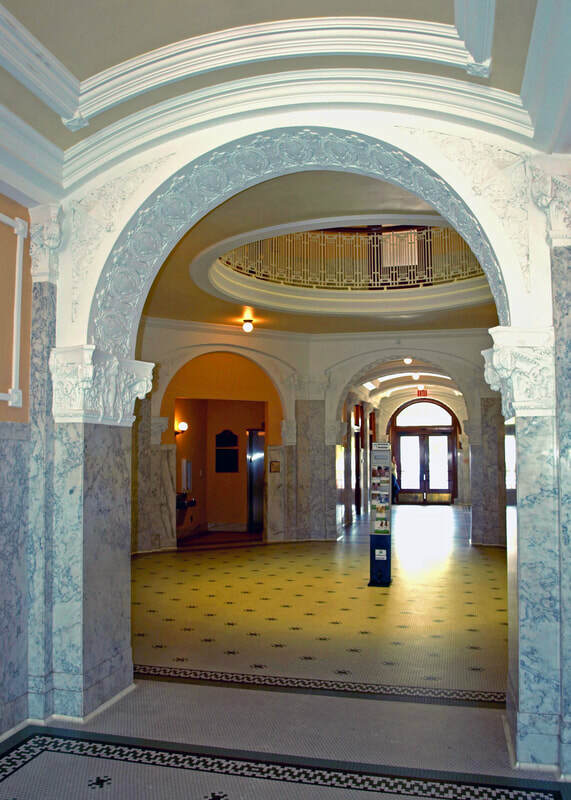 The plaster ornament on the interior is straight out of Louis Sullivan's work. 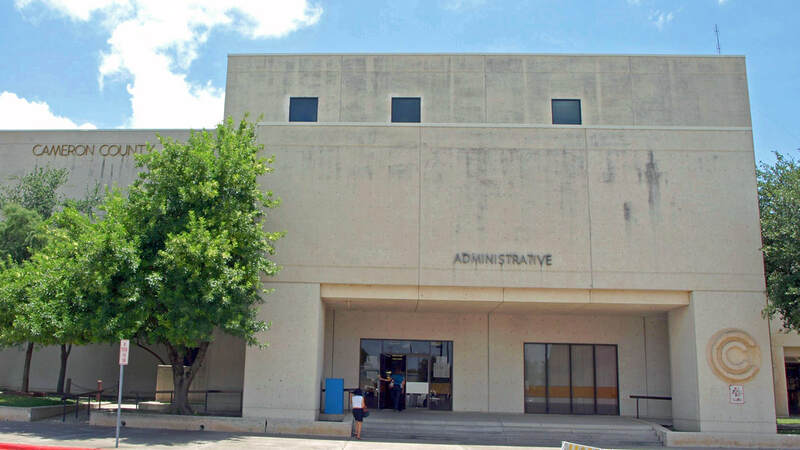 The majority of Cameron County courthouse functions are housed in a 1978 era building designed by SHWC Inc. 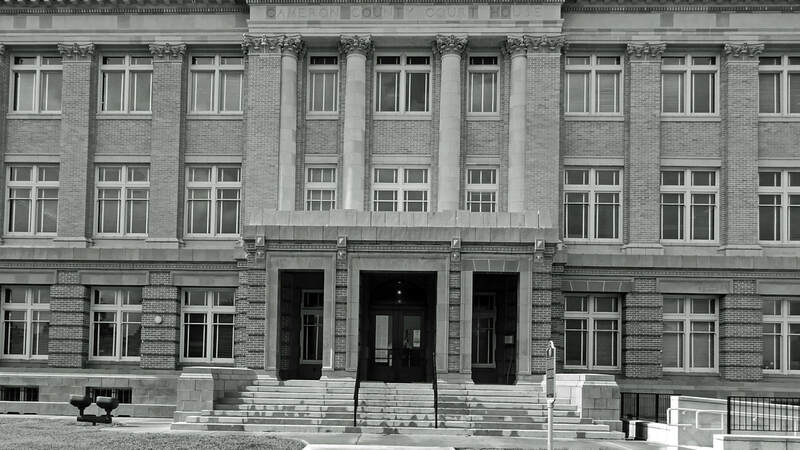 The 1978 courthouse is near the 1912 courthouse and the county jail. It is currently (2017/18) undergoing alterations. 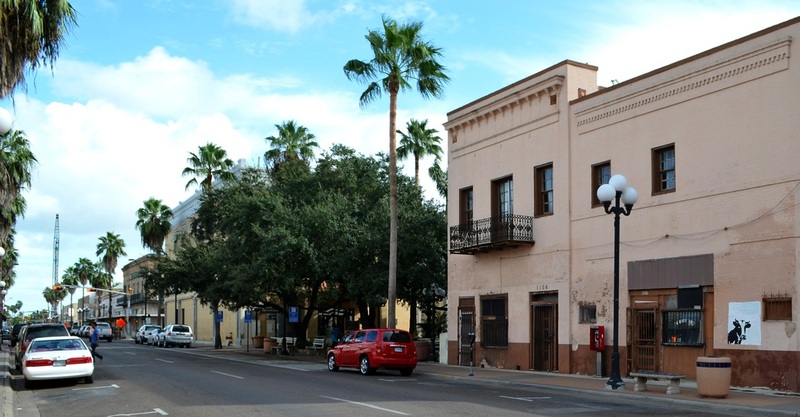 The Andres Pacheco building is on the north corner of the courthouse square.